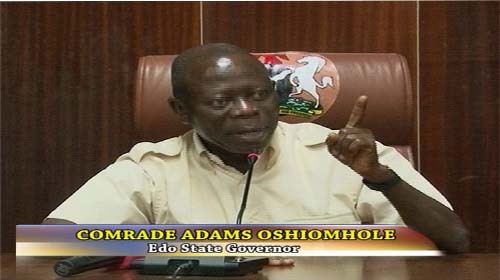 Governor Adams Oshiomhole of Edo State has alleged that the inability of the federal government to share money from the excess crude account in the last 18 months has distorted the developmental plans of state governments even as he raised the alarm over massive stealing of public funds. Speaking during when the Association of Enigies from Edo South paid him a courtesy visit at the Government House, Benin, yesterday, Oshiomhole said, “Over the past 18 months, we have not shared the excess crude account, and yet the account is empty. Sometimes we are told they have taken money from it to fund subsidies, including subsidy on kerosene, but your royal highnesses, there is nowhere in your various domains where kerosene is sold for N50. So in the name of subsidy, large sums of money are being stolen. “Things are tough now around the country because the federal government mismanaged our national resources and what is being stolen – nobody disagrees it is being stolen. What is arguable is who is responsible for this stealing”. Oshiomhole further said that “when the federal government and the president talk about oil theft, the amount that is allegedly stolen is so huge such that while we have the capacity to produce about 2.4 million barrels a day, what accrues into the federal government account is less than 1.8 million barrels a day. “From the last time we had a meeting, the handouts they distributed show that sometimes, for a period of two weeks, we were losing as much as 700,000 barrels a day and that has been on for the past 12 years”, Oshiomohle said. The comrade-governor further pointed that what it meant was that the national budgets had not performed over the past three years, whereas the budgets had been based on an average of between $77 to $78 and $79 a barrel, yet the average price of Nigeria’s sweet crude has been around $108 per barrel, a surplus of over $30 a barrel. He explained that Nigeria ought to be saving $36 per barrel and 2.3 million barrel a day over the past three years which would have amounted to over $30billion, yet the country could barely save $3 billion in the excess crude account. “Now oil price has dropped to $60 and because we have not saved, the naira is undergoing devaluation – already as low as N180 per dollar, and I believe by February when the elections are over, nobody is going to want to hold the naira. Whichever way the election goes, I expect that the naira will hit over N200 per dollar”, Oshiomhole said. He noted that the above scenario will heap more misery on Nigerians, with an expected fuel strike. “The inflationary consequence of that is prices of everything will go up and part of the vicious cycle of the devalued naira is that the price of petroleum products imported in dollars will go up in naira and government will be asking people who are already poor to pay more money for petroleum products”. He, therefore, urged the royal fathers to pray for Nigeria, saying “the year that is coming is going to be a very tough one. Pray for Nigeria, 2015 will be tough”. On the state projects, Oshiomhole said the Central Hospital will be ready for use by August next year while contractors will be mobilised to site at 2nd East Circular Road in the New Year. The governor also said 16 roads have been identified in the Government Reserved Area for immediate rehabilitation for which contractors have already bided. He promised they would be fixed in the first half of next year. D’banj Set To Bring Back Koko Water, Koko Garri?